So it's holiday season and spirit is distinctly that of Christmas across the world. So what do petrolheads do to spread the festive cheer in their own style? They dress their cars like Christmas decorations, replete with rice lights, and transform them into ultimate mobile Christmas trees! No joke, this; this team of friends got together to do their best to celebrate the festival in their own unique way. 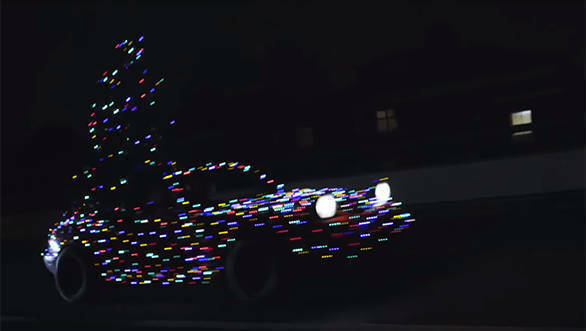 And the result is this awesome video featuring a Nissan GT-R, Mercedes-AMG GT, Honda, Toyotas, BMWs, a pick up truck as well as a Mazda Miata with a full-sized Christmas tree. The team is shown wondering how they can celebrate Christmas and one of them chances on a decorated Christmas tree, showing what they plan to do with their cars. Cut to a blank screen that lights up with 10 beautiful cars. The cars drove through London and recorded people's reactions and you are bound to be as pleasantly surprised and excited to see the cars as they were.